Aberdeen fell at the Europa League third qualifying round for the second year running as Kairat Almaty held on for a draw at Pittodrie. Leading 2-1 from the first leg, the Kazakhs stretched their lead when Gerard Gohou shot home on 59 minutes. 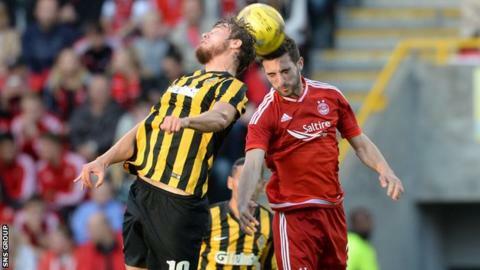 Aberdeen struggled to create openings but set up a frantic finale when Kenny McLean stooped to head in an equaliser. Deep into stoppage time, Paul Quinn's header was tipped over by Kairat keeper Vladimir Plotnikov. Roared on by a full house, the Dons dominated for long spells but you have to go back to 1984 for the last time they overcame a first-leg deficit at home. They have now won only one of their six home European ties since manager Derek McInnes took over and they will feel this was a great chance missed to improve that record. Gohou, who has scored 38 goals in 50 games for Kairat, returned after missing the first leg through injury. And the striker threatened within 15 seconds of kick-off by finding room for a strike that tested Danny Ward. The on-loan Liverpool keeper has made a habit of making important saves during this European campaign and he was alert again to block Stanislav Lunin's shot. Aberdeen then settled into the game and soon started to sweep forward with a pace and movement that caused the Kazakhs plenty of problems. The Kairat defence struggled to track the runs of McLean and Peter Pawlett in central areas while the Dons stretched their opponents down both flanks. Jonny Hayes looked the most likely to take advantage early on as he tested Plotnikov with one-long range drive, then whistled another just past the post. Kairat resorted to some crude methods to break Aberdeen's flow at times with Zarko Markovic, Anatoliy Tymoshshuk and Mikhail Bakaev all booked before the interval. Aberdeen continued to pour forward at every opportunity at the start of the second half, with Niall McGinn causing problems down the left flank. But just when the Dons looked to have the game well within their grasp they surrendered the away-goal advantage from the first leg as Gohou pounced. Mikhail Bakaev caused the problem with a shot from the edge of the penalty area that Ward could only parry and Gohou rammed in the loose ball for his fourth goal in the competition. Aberdeen, needing two goals to take the game to extra-time, went close when Shay Logan forced Plotnikov into a full-length near-post save and Hayes nearly lobbed the keeper with a chip from an acute angle. But the home side had a huge let-off with seven minutes remaining as substitute Serginho rattled a 14-yard volley against the crossbar. With six minutes left, the Dons levelled when McGinn curled a free-kick towards the back post and McLean headed home from close range for his fourth goal in five matches. With defender Ash Taylor pushed up front, Aberdeen almost scored the goal that would have forced extra time, with a brilliant save high to his left from Plotnikov keeping out substitute Quinn's header.